I remember when I started my digital nomad journey in June of 2015. I had a handful of books packed, paper notes and important documents that I needed. It didn’t take long for other nomads to make fun of the immense amount of paper I was using as a “digital nomad”. I was so custom to always doing things ‘traditionally,’ and I hadn’t quite figured out the whole online thing yet. Then came along Adobe Document Cloud to revolutionize my workflow. The books and papers added weight to my luggage. It didn’t take me long to learn how easy it is to go over the luggage weight limit (and how expensive). I eventually learned that when you’re traveling non-stop you need to be really careful of what goes into your suitcase. For each new thing added, something of equal weight needed to be taken out of my luggage. That being said, it wasn’t long before I caved and traded in my books for a Kindle. The amount of space and weight it saved by not lugging around books was well worth it. But then there were all my notes and important documents. Since I didn’t have a scanner with me and finding one abroad wasn’t the easiest task, I was stuck taking photos of important notes and documents with my phone. Capturing notes and documents as a photo was very limiting. I couldn’t easily search for key words or add additional notes and often times I couldn’t always read the photo clearly. Finally, I came across a tool that solves this problem and is making my digital nomad life easier and more efficient. This isn’t just another blog post about some great apps that make working remotely easier. These tools genuinely bridge the gap between paper and digital. They allow you to finally be paperless! So, the first tool I came across was Adobe Scan. This free app scans all my notes, documents and receipts. I just have to open the app on my phone, snap a picture and it automatically converts these documents into editable PDF’s. Even better, Scan uses Adobe Sensei to analyze all of the photos in my camera roll and surface only the ones that appear to be documents. I no longer have to sift through hundreds or even thousands of images to find what I’m looking for. Adobe Scan can do so many things! Adobe Scan has also really helped me capture digital copies of paper receipts. If you’re a digital nomad, chances are you are freelancing or a business owner. With that, you want to always keep your receipts so you can write them off at the end of the year for tax season! Again, lugging around piles or receipts when you’re traveling non-stop isn’t practical nor is it organized. Trust me, I’ve done it. And there’s nothing worse than wasting suitcase space on this. So, with Adobe Scan, I’ll capture my paper receipts and they are instantly available in a digital version. The key here is that the app auto recognizes the text so I can easily copy and paste that information into my Excel spreadsheet and have a real-time report of my expenses. When it comes time to send to my accountant, I’m able to take all my scans and combine them into one PDF using Adobe Acrobat, add password protection, and quickly and easily share the file. I spoke with my accountant just the other week to make sure it was ok that I just use digital receipts instead of paper copies and he said it was okay! He also likes that Adobe Acrobat’s “encrypt with password” feature helps me protect my tax documents. Finally, I want to address a challenge that many of us digital nomads face when trying to go paperless – signing documents remotely. I was super pumped when I came across Adobe Sign because it makes getting/giving signatures so much easier. You just fill, sign and send any form electronically across various devices. This is the ultimate way to go paperless and further embrace the digital nomad lifestyle. It’s a no brainer, Adobe Scan, Acrobat, and Adobe Sign can help you work smarter and faster as a digital nomad. Going paperless with business cards, receipts and getting signatures is only the tip of the iceberg of how these Adobe apps can make your life easier which is why I’m rating them the best tools to help you go paperless! 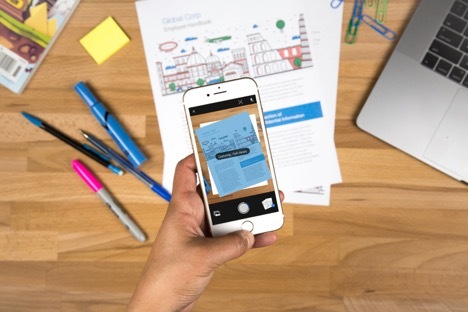 If you want to go paperless as a digital nomad, you can download the free Adobe Scan app for iOS and Android, and try a free trial of Adobe Acrobat. If you ever need get signatures remotely, try a free trail for Adobe Sign. Let me know how you go paperless as a digital nomad in the comments.